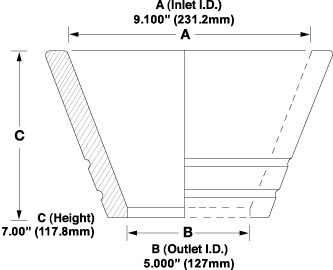 MRI 1790, 2000, 2000A angle cup, 2375, 3000, 4000, 5000. MRI 2000F filter cup with a 2.5" recess (63.5mm). 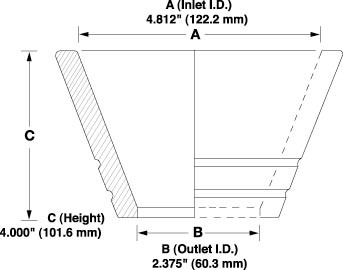 MRI 2375F filter cup with a 2.75" recess (69.85mm). MRI 4000F filter cup with a 4.5" recess (114.3mm). MRI 2000E, extended cup, for splash protection. MRI 2000 E-F includes a Filter Recess. 5.125" 1.790" 2.340" 24 22 lbs. 4.000" 2.000" 2.750" 48 38 lbs. 5.000" 2.000" 3.000" 24 25 lbs. MRI 2000 with 2.500" diameter filter recess. 4.000" 2.000" 3.750" 32 36 lbs. MRI 2000E with 2.500" diameter filter recess. 4.812" 2.375" 4.000" 16 26 lbs. MRI 2375F MRI 2375 with 2.750” diameter filter recess. 5.450" 3.000" 4.250" 28 50 lbs. 8.400" 4.000" 5.250" 168 900 lbs. MRI 4000F MRI 4000 with 4.500” diameter filter recess. MRI 5000 9.100" 5.000" 7.000" 60 517 lbs. MRI 2000 with 63.5mm diameter filter recess. MRI 2000E with 63.5mm diameter filter recess. MRI 2375F MRI 2375 with 69.85mm diameter filter recess. MRI 4000F MRI 4000 with 114.3mm diameter filter recess. So that you may inspect and test the MRI Pouring Cup Product, a free trial pack is made available with every Request For Quote submission. Simply select which of the above models most closely fits your needs and notify MRI. A trial pack will be shipped for testing and approval. All features contribute to improving casting yields by avoiding pour cup material inclusions in the metal or alloy casted. The MRI quality control program monitors dimensions, surface qualities and trace element levels. Testing and reporting of trace elements parts-per-million levels is performed by an independent laboratory. Trace element reports are provided to MRI customers, and cover iron, lead, zinc, silver, bismuth, antimony, arsenic, selenimum, and tin levels. 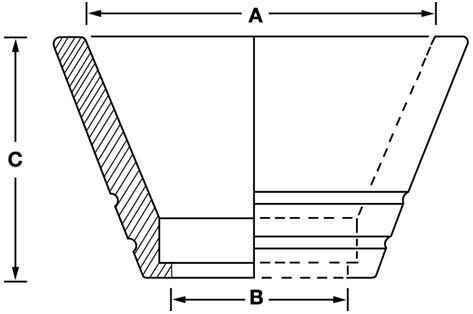 If a MRI Thousand Series pouring cup does not fit your need, MRI will assist in the custom design and manufacture of the specific cup required. MRI submits tooling cost, piece pricing, and drawings for review/approval before any work is initiated. 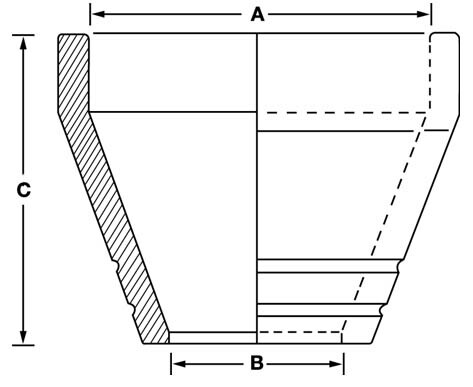 MRI pouring cups are produced from a high grade mullite refractory composition which has been proven in a wide variety of investment casting applications for over (40) years. 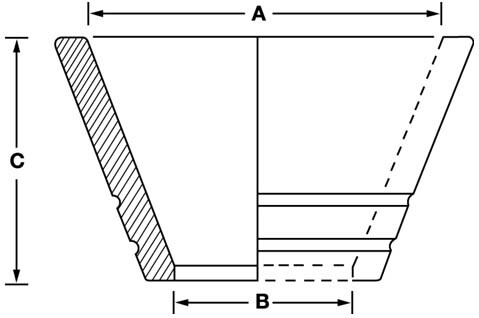 MRI 1790 offers an extra wide inlet ID for rollover furnace applications. MRI pouring cups are produced from a high grade mullite refractory composition which has been proven in a wide variety of investment casting applications for over (40) years. The MRI 2000 is MRI's original and most widely used Thousand Series Pour Cup. Also available with filter recess and/or extended height versions. MRI pouring cups are produced from a high grade mullite refractory composition which has been proven in a wide variety of investment casting applications for over (40) years. MRI 2000A offers standard 2.00" (50.8 mm) outlet with extra wide inlet suitable for many rollover furnace applications. MRI pouring cups are produced from a high grade mullite refractory composition which has been proven in a wide variety of investment casting applications for over (40) years. MRI 2000F (filter recess) model offers a 2.5" (63.5mm) diameter filter recess area to accept straight sided filters. MRI pouring cups are produced from a high grade mullite refractory composition which has been proven in a wide variety of investment casting applications for over (40) years. The MRI 2000E (extended cup) offers a 1.000" height extension for extra splash protection and greater pour volume. MRI pouring cups are produced from a high grade mullite refractory composition which has been proven in a wide variety of investment casting applications for over (40) years. The MRI 2000E-F, extended cup with filter recess offers a 1.000" extension for greater pour volume and a 2.500" (63.5mm) diameter filter recess area to accept straight sided filters. MRI pouring cups are produced from a high grade mullite refractory composition which has been proven in a wide variety of investment casting applications for over (40) years. 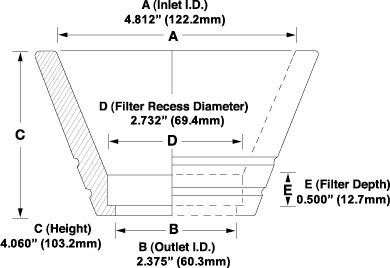 MRI 2375F (filter recess) model offers a 2.732" (69.4mm) diameter filter recess area to accept straight sided filters. MRI pouring cups are produced from a high grade mullite refractory composition which has been proven in a wide variety of investment casting applications for over (40) years. 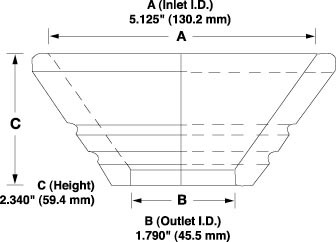 Smaller of two medium sized Thousand Series Pouring Cups, MRI 2375 gives larger pour volume while accomodating smaller sprue diameter. MRI pouring cups are produced from a high grade mullite refractory composition which has been proven in a wide variety of investment casting applications for over (40) years. 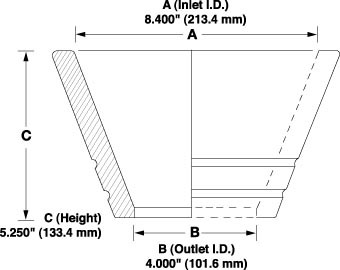 The MRI 3000 larger of two medium sized Thousand Series Pour Cups, the 3.000" (76.2mm) outlet allows for quick pour requirements. MRI pouring cups are produced from a high grade mullite refractory composition which has been proven in a wide variety of investment casting applications for over (40) years. 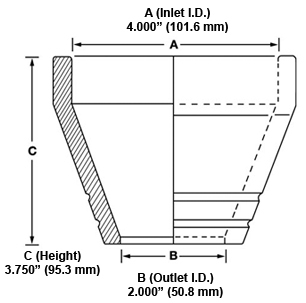 MRI 4000 -- MRI's second largest Thousand Series Pour Cup having a 4.000" (101.6mm) diameter outlet. Well suited for larger pours. MRI pouring cups are produced from a high grade mullite refractory composition which has been proven in a wide variety of investment casting applications for over (40) years. 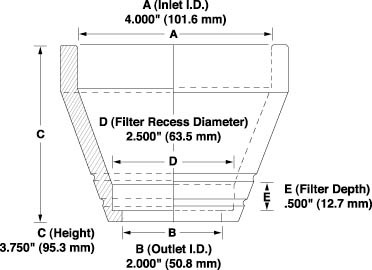 MRI 4000F (filter recess) model offers a 4.500" (114.3mm) diameter filter recess area to accept straight sided filters. This is MRI's second largest Thousand Series Pour Cup.